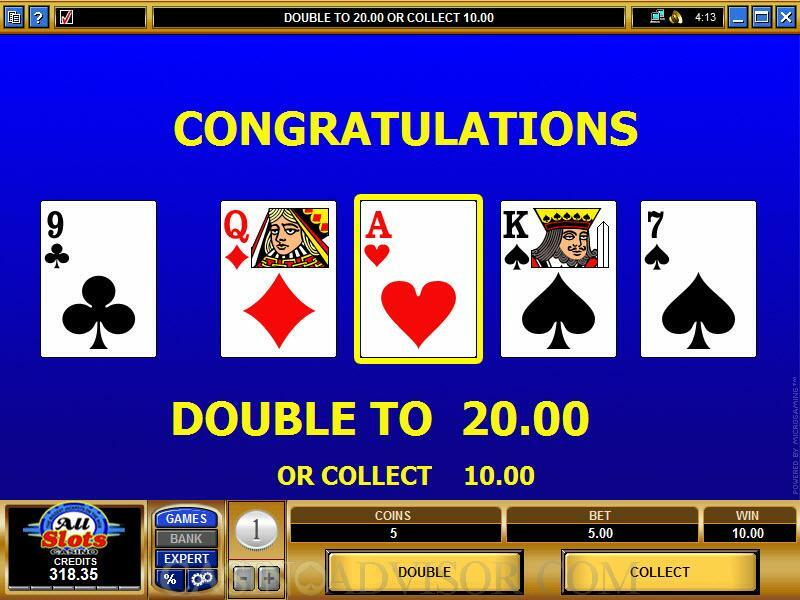 Double Bonus Poker is a strong video poker offering that is developed and designed by Microgaming, the leading producer of online casino software in the world. The game is very similar to the standard game of video poker, with the exception that there are certain winning hands that will yield particularly high payouts. All of them are Four of a Kind, but the payout is higher, depending on what rank it is. There are no wild cards in this game. 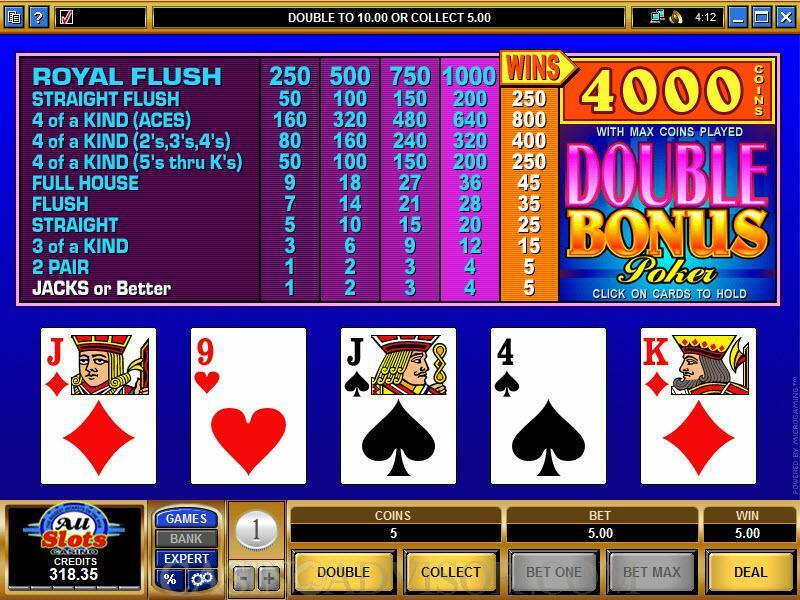 The maximum jackpot payout in Double Bonus Poker is 4000 coins, and that comes with a Royal Flush. 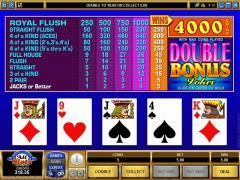 Double Bonus Poker is played with a standard deck of 52 cards, and there are no wild cards. The cards are shuffled before each and every game, so you have a random deal. To configure your bets, you can make use of the plus (+) and minus (-) controls, which, naturally, increase or decrease the size or your wager. When you click "Bet One" that means you are wagering one unit times the coin size, and when you want to bet the maximum, you just click "Bet Max." It's as simple as that. The "Deal" button starts the action, as you get your cards - five of them, in fact, at which time you will make a decision as to which cards to keep and which cards to hold. When you want to hold cards, just click "Hold." Then hit the "Draw" button and receive new cards to fill out your hand. Of course, you can choose to switch on "AutoPlay" (available in Expert Mode), which automates the process of playing your hand, including putting the same bet out there (for as many times as you designate) and playing the hands themselves according to a mathematically-correct strategy that is programmed into the software. After winning a hand, players have the opportunity to increase their wins through the process of "Doubling." Here's how it works - there are five cards dealt - one of which is face-up (the dealer's card) and four of which are face-down (the player's cards). The player selects one card and if it is of a higher rank than the dealer's card, the win amount is doubled. At that point, the player can decide whether to continue and double again or collect. 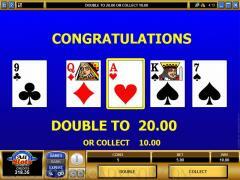 Interested in reading more detailed information about Double Bonus Poker? If so Click Here for more details.